I’m pretty sure it’s safe to say that last night’s game was quite possibly the most boring ‘Big Game’ I’ve ever seen. Yes, it’s true that I didn’t have a favorite team in the game, but because of that I was hoping for at least a little back and forth to keep things interesting, but..wow. It wasn’t even close. On top of the boring game, the commercials were a total letdown. Not one stuck out in my mind as being terribly inspired or funny – except for the Dannon Oikos commercial. That was pretty funny, although that could be my love of Full House talking. Needless to say, after halftime (which I did enjoy) I punched out and starting watching YouTube cooking videos. I’m not going to pretend that it was productive, although I did learn how to make Red Cabbage Sauerkraut, so that was pretty cool. Plus, I love Laura – she rocks. Then I got to thinking about what recipes and posts I was going to share with you this week, and even though these skillet nachos weren’t originally on the list, there are too many things about them that I felt you needed to know about, that I couldn’t not share them. So here they are. The number one thing that you need to know is that they are fantastically delicious. Another reason I wanted to share these skillet nachos with you is that the kiddos helped me make them, and I love to share recipes that are family friendly and get everyone in the kitchen together. This is one of those recipes that takes a few minutes of prep to get the ingredients cut, shredded and seasoned, but then after that, it’s pure assembly. Plus, it’s nachos, so the assembly can be a little willy nilly if you know what I mean. It’s chips and cheese, people. Which brings me to the main reason why I was hesitant to share this recipe: It’s chips and cheese, people. Do we really need a recipe for nachos? I’m arguing that no, no we don’t. So I really don’t want to call this a recipe, but rather more of a method. Put whatever you want on your nachos, refried beans, seasoned ground beef, grilled chicken, fajita veggies, tofu (no judgment) – seriously, whatever you want, throw it on. 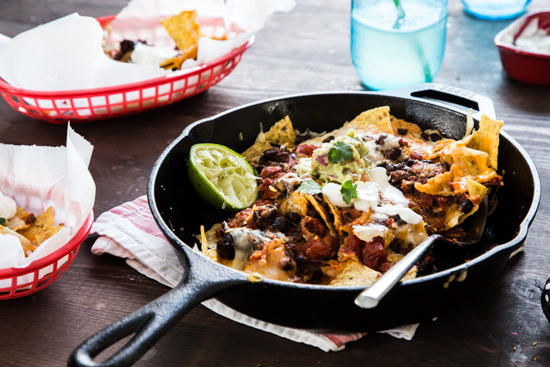 There are no hard and fast rules about these skillet nachos other than you should make them, and make them soon. In fact, making these nachos was the perfect activity to round out our Saturday. The Buddy had recently gone to a bowling birthday party for one of his friends and decided he loved bowling. He also felt that we all needed to go bowling together as a family, and soon. Well, my husband and I hadn’t been bowling in over 10 years, but figured it would be worth a good laugh, plus a great thing to go do together instead of being cooped up in the house all day. Well, we went and we had a blast. And then we came home and made nachos, so the day was pretty much perfect. We even put together a little video of the day, including making these cheesy, guacamole covered nachos. Also, if you haven’t been bowling in a while, you should totally go, it’s a riot. And then make these nachos. Is it just me, or did that music remind you of Napoleon Dynamite? If you’re interested more snack recipes and videos be sure to check out Jenni’s killer Cuban Sandwich Empanadas. She has given more one more reason that I really need to get a pressure cooker! Also, Amy’s Turkey Chili Casserole will be on our kitchen table very soon. Everything about it looks fantastic! In a small skillet, heat oil over medium heat. Add beans, salt, pepper, cumin, chili powder and hot sauce. Stir together and mash gently with a wooden spoon until beans are hot. Remove from heat. In a large cast iron skillet, layer in chips, cheese, mashed black beans and salsa. Repeat layering at least one more time or as much as your skillet will allow. Top with more cheese. Bake nachos in a 425 degree oven or until chips are hot and cheese is bubbling, about 10-15 minutes. Remove from oven and top with guacamole and sour cream. Serve hot and enjoy! These ingredients are purely suggestions. Besides the chips and cheese (that I strongly recommend) layer any of your favorite nacho ingredients in the skillet in whatever quantities you see fit. Bake them in the oven and serve them up! 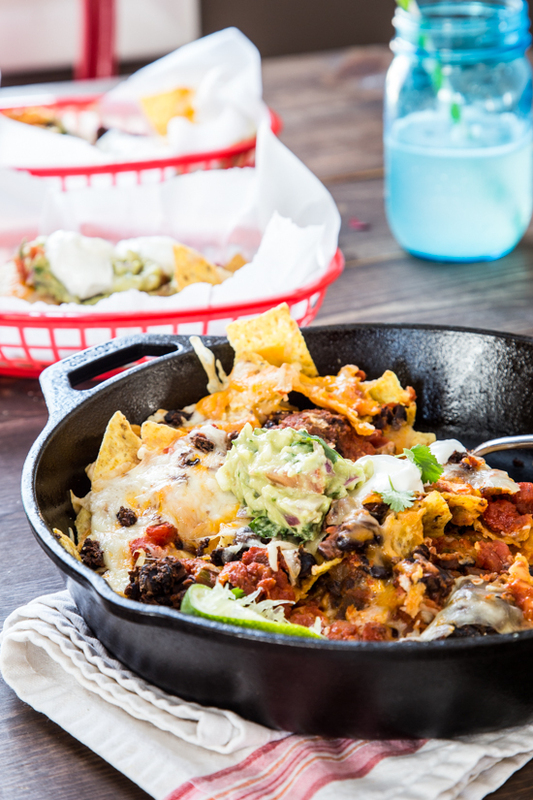 What is it about nachos in a skillet that makes them taste 10,000x better? I may have to make a whole batch all to myself for dinner tonight. Yes! I swear I’m at the point where I could forfeit 90% of my cookware because I’m making everything in my cast iron skillet. It’s crazy how versatile it is! I am so with you about the whole recipe for nachos thing! I feel the same way about lots of things, but right now, s’mores are at the top of my list! I can attest to the deliciousness of the skillet nachos–thank you for inspiring me to make them the other day. We didn’t have all the lovely avocados and tomatoes that you had, but we did make homemade refried black beans and layered everything with pepper jack and cheddar. Served with a chili-lime salsa (which was slightly underwhelming–way to go, Pace people) and sour cream, which is one of my favorite things, they really hit the spot! Thanks for sharing the empanadas–those things were ridiculous! =) Love Amy’s casserole too–while I almost always thicken my chili with corn meal, it never occurred to me to do that for a casserole. Amy is the smartest! I’m glad you decided to share this nachos to inspire other people to make their own version! Yes! Who needs a recipe for s’mores?! Maybe some inspiration on ways to mix them up or perhaps some new twists, but a recipe? Nope. I’m so glad you made some nachos! I have been throwing everything in a skillet lately, I’m feeling like Rapunzel with my attachment to my trusty skillet, lol. Amy’s casserole was completely delish! Thanks so much for stopping by, Jenni!! That video was adorable ! Wish I could have been there to sample the finished product, looked delicious. Hmm it appears the Buddy is a fan of cheese 🙂 the music, very Napoleon Dynamite, BTW I made your stuffed mushrooms for game day yesterday they were a huge hit ! Yay! Thanks so much! I’m so glad the mushrooms went over well 🙂 Can’t wait to see you guys – hopefully sometime soon! You may not need a recipe for nachos, but pictures sure are nice to look at, and making me hungry at that! YUM! There is something amazing about looking at pics of nachos, right? Never fails in making me crave some!! Thanks so much! Cute video, great looking nachos! You’re welcome, Celia! Thank you so much for stopping by!